January 20th. You might receive this copy before or after, but it is planned to launch the new Acumen website on that date. Thank you to everyone who has contributed: firstly the Arts Council who have supported the project, then Danielle Hope, the advisory editor, who helped with both the ACE application and the design, and last but not least, you the readers who filled in the questionnaire and sent in your comments. I hope you find the new site easier to read and navigate, but if you have problems, I trust you will let us know. However, to make the site exciting I need your involvement. 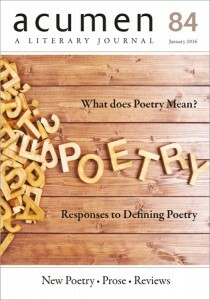 I need poets with poems in any issue to send us news of their publications or readings. I can’t use all simultaneously for the four months any issue is current, but a mention will be used in the ‘news and events’ pages. Also please look in the new shop. There you can find all the Acumen Publications for sale, and hopefully buy those in which you are interested. Young poets: send in your poems for use on these on-line pages. And not just your poems, but also your ideas, comments, views on other poets. This way we can keep an active site. And so to this issue: well, Stan Frith certainly stirred up −and divided − the readers. There are those who thought he was spot-on, and those who thought he was nothing but a dinosaur! Some interesting comments on both sides of the argument in the Responses pages. Then there is John Snelling’s serious article on poetry and his rather tongue-in-cheek poem which follows; again two sides to poetry. Poetry is a very catch-all word encompassing everything from standup performance poetry to the poems best read and studied in solitude. Acumen and Torbay Poetry Festival does try to give a fair selection from across the board. 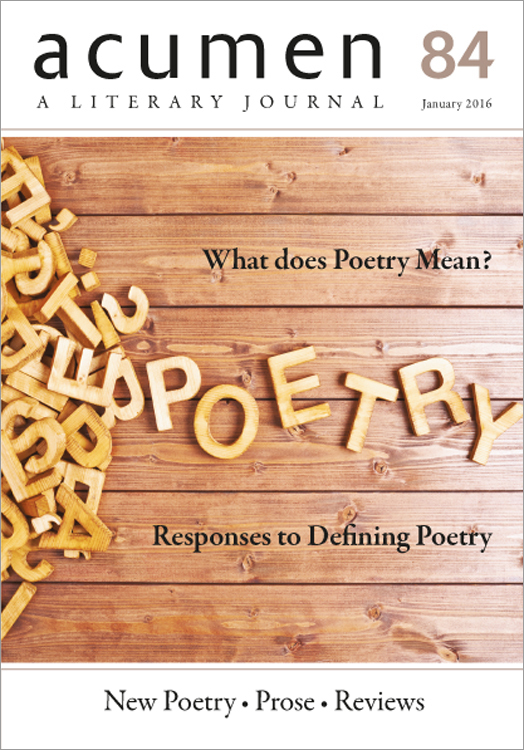 However, performance poetry is often lost on the page without the performer and very dense poetry is often skipped over in a magazine but read and appreciated in a volume of verse. Acumen tries to reach as far as it can in each direction.